We are really excited to be able to share Robert Kaufman's Kona Colour of the year with you. Flamingo Pink is fabulous. To celebrate its arrival in the UK this month's parcel is packed full of gorgeous Kona Cotton. 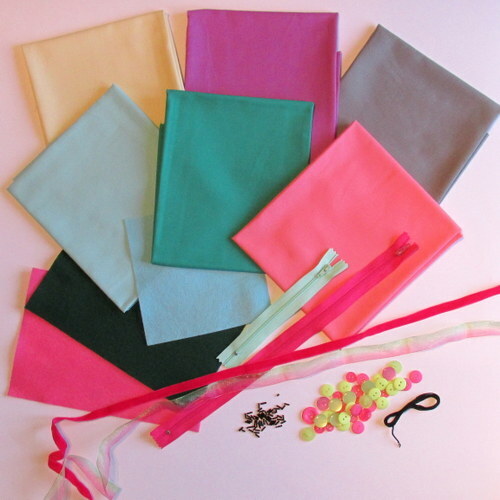 These high quality plain dyed cottons are the solid of choice for a growing number of quilters and are great for all sorts of sewing projects. Contents: Six Fat Quarters of Kona Cotton by Robert Kaufman (including the colour of the year, Flamingo Pink), 1m of sheer watermelon ombre ribbon, 1m of bright pink velvet ribbon, 14" zip, 6" zip, Watermelon button mix, Black opaque glass bugle beads, 1m black duchess embroidery thread, A5 candy pink felt, A5 green felt, 6" square aqua felt. 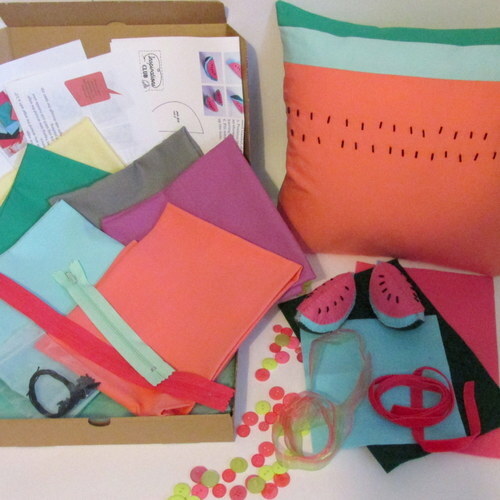 Instructions are included to make a Watermelon inspired cushion and a cute felt watermelon.